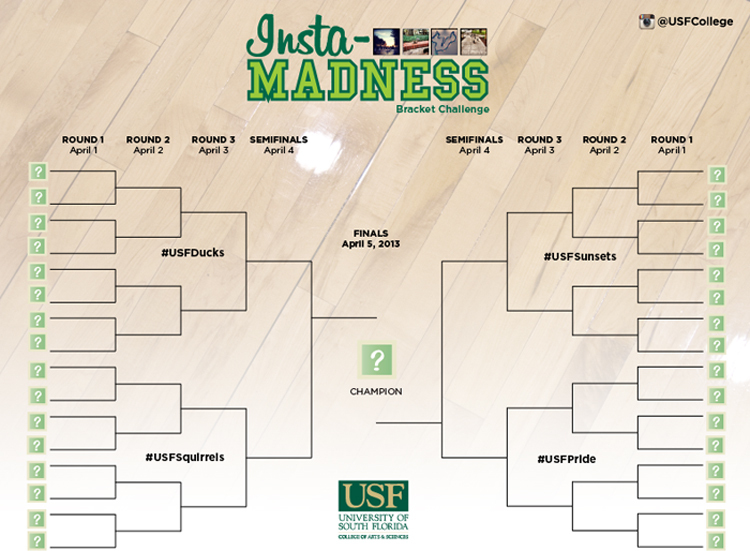 TAMPA, Fla. -- What happens if you cross Instagram with March Madness? Why, Insta-Madness of course! We’ve got a bracket challenge that’s open to all University of South Florida students, faculty, staff and alumni. To submit an entry, you need to have the Instagram app on your phone (download it for free for Apple or Android users) and follow us, @USFCollege. Take a photo and tag your submission using @USFCollege #InstaMadness. You’ll also need to indicate which category you are entering: #USFDucks, #USFSquirrels, #USFSunsets, #USFPride. These photos must be taken on the USF Tampa campus with its location tagged on Instagram. We’ll narrow down the submissions to the top 32 photos into four categories. We’re looking for the cutest photos of #USFDucks and#USFSquirrels, the most breathtaking #USFSunsets, and the best displays of #USFPride. Then, it’s up to you to cast your vote in our bracket challenge. The four finalists receive a Keep Calm and Go Bulls poster, and the overall champion receives a Keep Calm and Go Bulls T-shirt and coffee travel tumbler. The deadline to submit a photo is March 29, 2013. Bracket voting will take place April 1-5, 2013. The winner will be announced April 8, 2013. You may enter as many photos as you want, as long as it is relevant to our four categories. If you have any questions, please post below.